It's fashionable to rip the guts out of this story. But that's rather too easy to do and let's face it all the criticisms have well and truly been made. It would be lazy to repeat them. Some viewers are convinced the story was a production team joke in order to see how far they could go in sending the series up. Is it a send up? No, I don't think so. There are too many good things about Nimon that sort of make that view untenable. Yes, that's right...good things. Superb trailer courtesy of biggerbaddaddy on You Tube. OK, it's not the best script of the season and it heavily relies on Anthony Read's obsession with Greek myth. Trouble is, he's not doing a particularly good homage to the story of the Minotaur. In fact, most of the myth is missing. Try saying that after a few gins. There are some basic allusions to the story and Greek heroes but it stops there. So, if his intention was to explore the mythic nature of the Greeks as a template for the Doctor Who format itself then it's all too fast and loose for that theory to hold any water. That's not to say that mythical storytelling shouldn't be in Doctor Who. By 1979, the power of myth was everywhere in cinematic science fiction. It was the trend du jour. So what have we got. The Doctor and Romana discover a ship load of kids on their way to Skonnos as 'tribute' to the Nimon. The Nimon are bull headed creatures in platform shoes and dinky loin cloths planning to continue their conquest of other worlds by draining them of power. 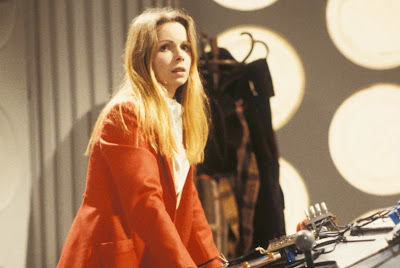 Romana does all the hard work and the Doctor takes the credit. It's all about power, y'see. The misuse of power (Soldeed), having power thrust upon you (Seth) and power changing hands (Romana plus the 'tribute'). It's about being a hero when you're not expected to be and when you don't want to be - and that could fit with either the Doctor or Seth in this instance. 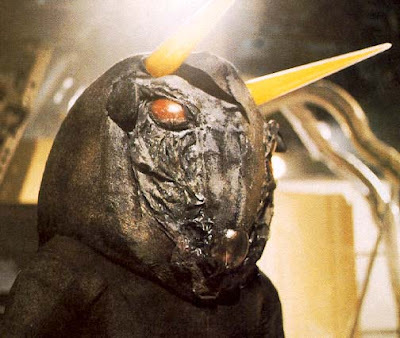 And it's also a supreme example of the female principle in action which is where the Lalla Ward version of Romana has been heading all season. She takes over the function of the Doctor, makes the decisions, makes the mistakes. For all intents and purposes, the Doctor's put her on a personnel training course! And Lalla grabs the opportunity of the script and doesn't let go. She's more Doctorish than the Doctor and her actions say an awful lot about our perceptions and expectations of the masculine hero. The script sparkles with lovely jokes which makes Nimon a frustrating experience, because everything else more or less contrives to bury its flashes of brilliance that often surface in a sea of mediocre production values. Cheap, bad design ranging from the studio interiors representing Skonnos and the Power Complex (the entrance is a set of drapes!) to the platform wearing Nimons who totter all over the place like a bunch of inebriated drag queens. Painful to watch, the Nimons really had a lot of promise, were a fascinating and terrifying concept, with the voice effects at least lending them a certain amount of credibility but from the page to the design to the performances there is a struggle to make them visually threatening. The visual effects are variable, some shot on video and some shot on film. The projected corridor from the TARDIS to the Skonnos ship works quite well as does the spectacular final destruction of the Power Complex. But overall they seem to lack a kinetic thrill and suggest a production team going through the motions. And then Graham Crowden and Malcolm Terris carve themselves some juicy slices of ham for their performances with Crowden really having difficulty stopping himself from corpsing at times. They both thought 'I'll do my Doctor Who acting, I can get away with murder on this show' and it does show. Crowden's 'death scene' is an epic of truly camp proportions, over-ripe and ridiculous but the epitome of how far along the 'camp/juvenile' line the show had traveled in order to defy expectation. However, it is entertaining in a very strange way and if it catches you in the right frame of mind after a well prepared gin and tonic. Again, we have another example of the perceived notion of the show up until 2004 - a camp, cheap runaround in corridors. Thankfully, they're better disguised in the new series! The 'tribute', or the kids from Aneth should I say, are a pretty wet bunch and Simon Gipps-Kent and Janet Ellis do at least attempt to give us a bit of characterisation and play out the conflict of 'heroic expectation' between Seth and Teka with much conviction. But this entire show belongs to Lalla and dressed in her red hunting gear she elevates Romana to truly heroic proportions, leaving the Doctor to play second fiddle for a while at least. She plays it straight down the line and leaves Tom to do all the goofy Tom bits. If they'd decided to re-cast her as the Doctor at this point in time, I don't think I would have complained. It's her finest 90 minutes. Nimon went out as the last complete Graham Williams production. Looking back now his 'idea' for the show does seem to have exhausted itself. Shada actually brims with the possibilites of a second phase under Williams but I'll go into that next time. Here, we've got a witty, clever script with interesting concepts and ideas being drowned in banal design and over-acting. It feels tired despite Lalla's performance and it's almost a comment on audience expectations in itself - the continuing desire to see a series of dumb masculine heroes and villains doing their thing week in week out. The viewing figures were very healthy (an ITV strike helped) so when it all changed eight months later it's interesting to note how many millions abandoned the show. 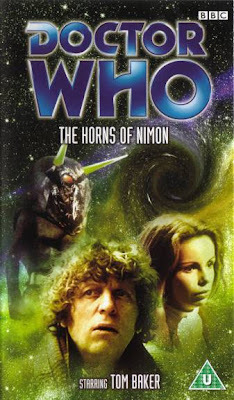 More seriously, how ever much we might criticise Nimon and Season 17 as a whole it was still a series that told reasonably straight forward and engaging stories augmented by production design and visual effects of varying quality. From Season 18 onwards, arguably, this is turned on its head, visual gloss and surface sheen would service and dominate scripts of a convoluted nature. As Shada was abandoned, this is the final televised serial to use the original 1963 arrangement of the Doctor Who theme music, revised slightly over the years, but essentially the Delia Derbyshire composition. Also making its final appearance is the diamond-shaped series logo introduced during the last season of Jon Pertwee. Bigger changes were happening in cinema and in pop video production and advances in visual communication and production were already dominating trends. The series seems almost set in aspic in 1979, favouring a satirical, Swiftian literary tradition over the visual storytelling of everything from Star Wars to Bowie's video for Ashes To Ashes. You remember staying at this place back in 1983?